AG (AGAMOUS) is a probable transcription factor involved in the control of organ identity during the early development of flowers. AG is required for normal development of stamens and carpels in the wild-type flower. AG plays a role in maintaining the determinacy of the floral meristem. AG acts as C class cadastral protein by repressing the A class floral homeotic genes like APETALA1. AG forms a heterodimer via the K-box domain with either SEPALATTA1/AGL2, SEPALATTA2/AGL4, SEPALLATA3/AGL9 or AGL6 that could be involved in gene regulation during floral meristem development. 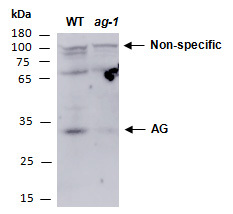 Rabbit polyclonal antibodies were produced by immunizing animals with a GST-fusion protein containing the N-terminal region of arabidopsis thaliana AG (At4g18960). Antibodies were purified by affinity purification using immunogen. overnight (data provided by L.Zhao, FAFU , China).